An "Orthochrome" postcard by A & G Taylor of London. It was posted in 1908, but the picture may have been taken as early as 1890. 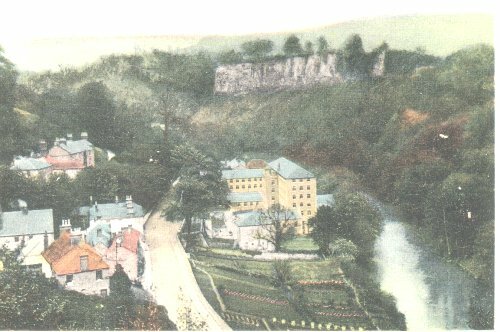 The large building in the centre is Masson Mill, built by Richard Arkwright in 1783. In 1897 the Mill was handed over to English Sewing Cotton Co, and the Mill was expanded. In 1907 a tall chimney was built on the Mill. 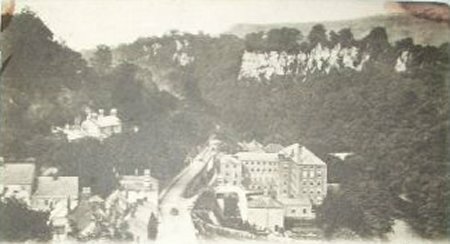 The 1907 card is poor quality, and was taken later than the orthochrome: trees have grown and two have been cut down, but the tall chimney has not yet been built.